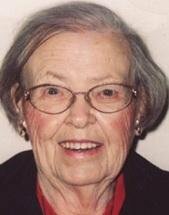 WATERLOO - Helen E. Anderson, 94, of Waterloo, died Monday, Jan. 11, at Friendship Village Pavilion. She was born May 30, 1915, in Keota, daughter of Walter and Addie Romine Stewart. She married Norman DeLos Anderson on April 30, 1946, in New Buffalo, Mich.
Mrs. Anderson graduated from Carthage High School, Carthage, Mo. She worked as an interior designer for Ethan Allen Carriage House for 15 years, retiring in 1975. She was a member of Westminster Presbyterian Church. Survived by: her husband; two sons, Duane (Fran) of Kenosha, Wis., and Bruce (Jan) of Cedar Rapids; two daughters, Joan (Jack) Bond of Waterloo and Marilyn (Paul) Bargman of Dike; 11 grandchildren; 22 great-grandchildren; eight great-great-grandchildren; and a sister, Vida Ebener of Waterloo. Preceded in death by: a great-granddaughter; four brothers, Gerald, Warren, Milford and Merlin Stewart; and three sisters, Myrtle Farnsworth, Janet Wolshlager and Jean Schinske. Services: 11 a.m. Saturday at Westminster Presbyterian Church, with burial in Garden of Memories Cemetery. Public visitation from 4 to 7 p.m. Friday at Kearns, Huisman-Schumacher Chapel, and for an hour before services Saturday at the church. Memorial fund: has been established in her memory.